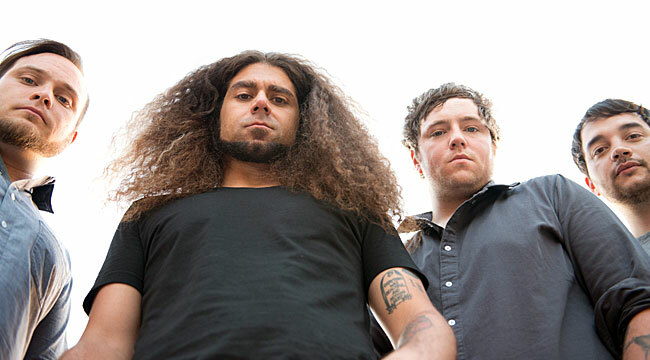 If you were to try to find a vinyl copy of Coheed and Cambria’s second album, 2003’s In Keeping Secrets of Silent Earth: 3, you’d have a hard time. But the band recently issued a remastered version of the disc on vinyl in three distinctive configurations: an 180-gram 2 LP audiophile pressing; a limited “Neverender IKSEE: 3” Tour Edition tan splatter 2 LP (available exclusively at each tour stop); and a special Direct 2 Fan grey swirl splatter 2 LP (already sold out). The band is also performing In Keeping Secrets of Silent Earth: 3 in its entirety on its current tour. Guitarist Travis Stever phoned us from an Austin tour stop where he was feeling particularly nostalgic. “It’s like walking down memory lane,” he said. “All the music venues are not too far from each other. We’re playing at Stubb’s tonight but you pass Emo’s and I passed all the clubs I played throughout the years. It’s kind of cool because it all goes in a circle. We go back to that era. It was the small room in Emo’s where we played originally.” Here’s what he had to say about revisiting the album. Talk about the decision to revisit In Keeping Secrets of Silent Earth: 3. What made you decide to reissue the album? I collect vinyl and I wanted my own copy. But in all seriousness, it has been in the works since it became the ten-year anniversary. There was a high demand for it to be reissued on vinyl because there is a resurgence. People are collecting vinyl again. The album wasn’t available anymore. You’d find one of the old ones online for an astronomical price. We decided if we were going to wax it again, we wanted to make it worth it. The touring was the same thing. We love revisiting the record. We loved doing them all together. We wanted to celebrate the record we made now that it’s been ten years. Talk about the initial recording session that took place in Woodstock, New York. Was this a difficult album to record? We recorded at Applehead and we’ve done a lot of work there. It wasn’t that we were new to the studio. We had mixed The Second Stage Turbine Blade at that studio. Those guys were like family to us. Chris Bittner plays bass in the band 3 when Josh [Eppard] played drums. They had a close relationship. Mike [Birnbaum] produced the free stuff from early on. 3 is a band that is still going now and will release a new album soon. In their teens, Josh was in that band with Joey and Chris Bittner played bass. We had this relationship with everybody in the studio. The majority of the magic happened in that studio. Some of the songs were created right there in the live room. That studio will always have that vibe for us. We did Apollo after that there. And we did Afterman there too. Your shows have regularly been sold out. Ten years on, why do you think the songs still resonate? It’s really surprising — not that we’re not proud of this record and don’t think it deserves the praise. It’s a relief to know that the fans support us and love us in that way and holds the importance it did back when they were younger. There’s a nostalgia side to it. It might be their favorite record. Or it’s the fact that they like the band. There are people who have become fans in the last two years and have revisited the album and now they see this landmark album performed live. That’s when we came into our own. If The Second Stage was a cocoon forming, In Keeping was us popping out like a butterfly. Listening to the album, I’m surprised at how accessible it still sounds. Many of the screamo and progressive metal bands from that era were about making as much noise as they could. To what do you attribute your sense of melody and ability to deliver a tight rock tune like “A Favor House Atlantic”? First and foremost, when discussing In Keeping in particular, a lot of those tunes came from Claudio on an acoustic guitar. Back then we would sit together and I would try to write guitar parts that were favorable to all the melodies. If it was only a guitar part he had, then I would try to write something that propelled it. That’s been my take. For the rest of the band, it’s almost the same, just with different instruments. There were definitely songs like “21:13” where there’s studio magic; a lot of things happened in the live room. But for that album specifically, those songs were built first and foremost through Claudio on an acoustic guitar. It’s an evolution of his songwriting style through hearing everyone else’s playing style and how they’ll favor the songs. That’s always been the Coheed way. In Keeping was us coming into it. Later on, there were different ways to experiment and it didn’t have to start with an acoustic guitar. We release a cassette tape if you buy the deluxe package and it has seven or eight of the songs demoed. The meat of a song might be there but it changes when everyone is on it. Certain songs are called “Stroke Me” or “Stairway to Heaven 2” or other hilarious names. We’re always creating. There have been things going on, for sure.